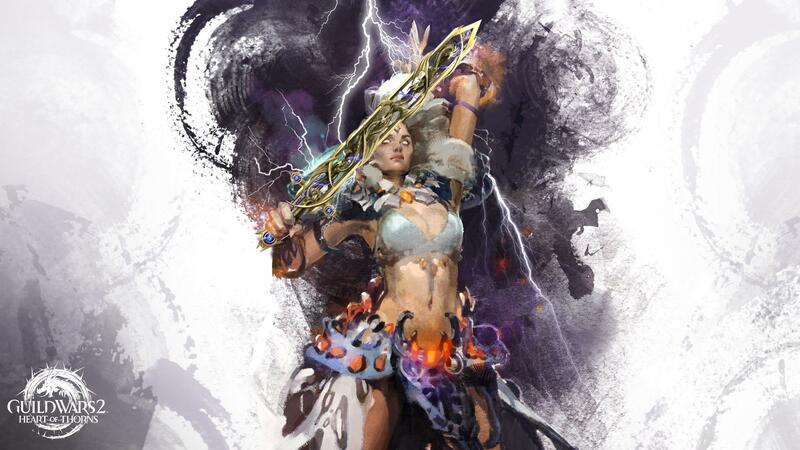 So today, the teaser for what we can only assume to be the Tempest - the elite spec for the Elementalist - has been revealed. A lot of folks seem to be awful miffed that the Tempest is seen with a warhorn, not a sword that seemed to be so popular. So after seeing this reveal and it's concurrent reaction, I wanted to expand on what the idea behind elite specs is. So the idea that each elite specialization is bringing a new usable weapon type to each profession is awfully enticing. From what I've been reading, a lot of folks are seeming to treat this as though the new weapon types are becoming baseline for the profession. I was thinking about how incredibly not the case this is. I was thinking of how Necromancer, a class that the majority of the playerbase (myself included) have been clamoring for years for this class to get a proper cleave weapon. Well, with the introduction of the Reaper, we finally get one! ...Right? Well, here's the thing about that. In my absence from game I've had ample time to theorycraft with the new specialization system, and I wanted to see what kind of awesome build I could make to go with a cool new GS, until I realized I couldn't use a lot of traits I like because I'd have to dedicate an entire spec line into Reaper just to use it. a.) New elite spec weapons are not added to the baseline prof, and that the new weapon type isn't even required when specced for the elite specialization. I realized this when I remembered I would need to dedicate an entire line to Reaper to use greatswords, and how insignificant it is to fixing the mountains of the problems that necromancers have already. Maybe this would be better as a post to reddit or something, but I want to know what you all think on the issue after seeing the reaction to the Tempest. Maybe it will be like the Chronomancer who ended up looking a lot cooler after they properly showed it off? Personally I think warhorn looks like it could be something mighty interesting, matching the whole "stormcaller" theme, but I don't main ele, so I don't have as much of a perspective on the issue. Thoughts? When they announced chronomancer everyone was like "WOW, BEST CLASS EVERY, F U ALL YOU GONNA DIE" but once you dug deep into it, and realized you'd have to sacrifice SO MUCH just to obtain the elite spec. Now, does the elite bring more to the table, absolutely. 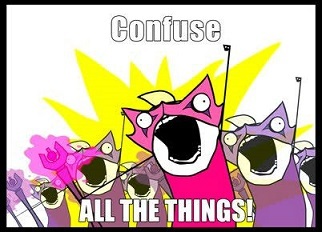 But since I'm a mesmer guru lets look at the typical play styles. You have condi shatter, burst shatter, phantasm build, mantra build. Now if you substitute one trait line (which synergizes so well with each other for the different play styles). What that means is if you want to continue with a phantasm build, while use chronomancer/shield you'd have to sacrifice so much of your build just to do so. Worth it in PvE? perhaps, its fun, WvW and PvP, no. because it will no longer be viable. Ele Rage. I read a lot of hate already lol. Well all i can say is this to the elementalist fans. Welcome to mesmer issues 101. Ele's have 2 main hands 2 off hands and soon 3 off hands with warhorn. 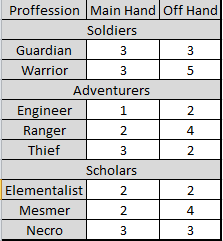 Below is a chart of current reality (not including elite spec weapons or the revenant) of # of options for main hand and off hand for all classes. I'm only upset about the warhorn, because I think sword would be cool... That's basically it. Elite specs aren't supposed to be an upgrade; they're options. Everything about them is optional. Hell, if the sword didn't have any skills I liked, I was going to keep on with my daggers (and occasional septer). No big deal really. I only see Elite specs how they are. 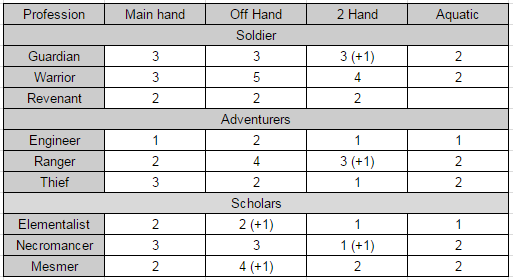 Added traits and abilities to the already existing pool for each class. And don't forget there will be more in the future. ANet have hinted they've already got more in the works. A little bummed my elementalist will not be holding Bolt any time soon, but I'm cool with just getting new stuff to try. Updated with 2 handed weapons. I will add to this. I think the problem with your vision of things is, you want the elite specialisation, but with the same play style. But what these elite specs bring, is a new way of play. Forget the existing meta, or your existing way of playing. If you choose your elite specialisation, you'll focus on a new style of play. Like the reapers, with their cleaves and tons of chills., that's going to be your main play style, chilling everything around you, so you can cleave every single one of them within range. The slower movement speed will make them vulnerable to incoming AOE and such. I guess time will tell. But, from the Necro, Mesmer, Guardian that "new play style" you speak of doesn't exist, because there aren't strong support trait lines to go with the elite trait line. There are strong lines, but not viable ones that you would sacrifice that much for. That is why i said it'll be good for PvE not WvW and PvP because while its good, its not great.